This clinic, along with all its many accessories, pack up nicely in the durable carrying case. Thoughtful details and plentiful accessories are what give Playmobil sets their charm. Filled with furniture, medical supplies, machines, and other tiny accessories, the four people included with this set will have plenty to interact with. Of course, other toys can get in on the treatment, too. With very positive feedback, this set sparks imaginative play. Users report children playing with this set at least once a week, and it is often chosen as one of the sets taken when traveling due in part to its locking mechanism which keeps everything nicely tucked away inside. The playset closes up and locks with two little swinging levers on the back. A handle makes the whole set easy to transport. All the included pieces easily fit inside the case. Four figures: A nurse, a doctor, an adult woman, and a child. Casts for the foot, hand, and bandage wrap for the head. All pieces fit the child, not the adults. A wheelchair, which also fits the child, not the adults. A bed split into an upper and lower section. Each section can be raised and lowered. A flexible lamp attaches to the bed. An ultrasound machine with surgical tools and tubes of gel. Desk with moveable drawers, computer, file folders, and a book. A machine with moveable shelves, a set of books, and tubing. Two chairs, and a potted plant for the waiting area. Pretend to treat injuries, either on the included figures or other toys. 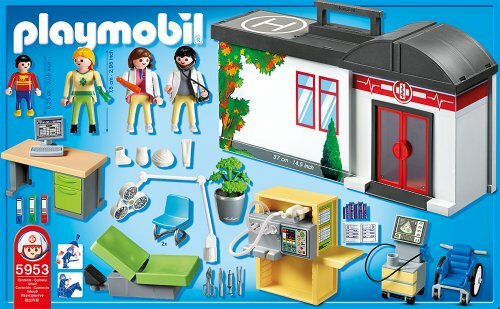 Known for their attention to detail, this Playmobil Hospital does not disappoint. Everything from moving desk drawers to medical tools and supplies to a potted plant, a great deal of effort has been put into making this set a high-quality prop for a child’s creative narrative. There’s even the name of a real company etched across the bottom of the potted plant. Everything packs up into the playset for easy storage. The locks on the back are secure but also smooth and easy for even toddlers to manipulate. A little carrying case folds down when not in use, so as not to ruin the look of the building’s roof. This is very important, as we have been informed by some very knowledgeable children. Folding up and down at both head and foot, the medical bed is concaved so the Playmobil figures will sit in it quite comfortably. We didn’t have too much trouble with them sliding off, even when the bed was propped up as high as it can go. For whatever reason, only the child can fit into the wheelchair or the casts and bandages. The child seems to be smiling an awful lot for someone who needs that much patching up, but hey, maybe it was all worth the story that he’ll later tell his friends. Many users have reported this being a set that gets played with very frequently, but not just with the included figures. Action figures, ponies, and the occasional bath toy may find themselves in need of medical treatment after doing something that was probably really cool. Toys that encourage children to play pretend offer opportunities for them to explore scenarios they might not normally have the chance to do in real life. This means they could work through multiple ways of overcoming obstacles, or try and understand what it may be like to be someone else. Engaging children’s natural curiosity about the world around them, toys that drive the imagination can help them use storytelling and narrative play as a way to explore that world. Stories that focus on taking care of the injured and sick may help children develop empathy and compassion. For more information on how to clean toys, check out our Cleaning Guide for Toys. Many users have reported getting the Rescue Ambulance set to go along with this one. Contains small parts that could prove choking hazards for very young children. 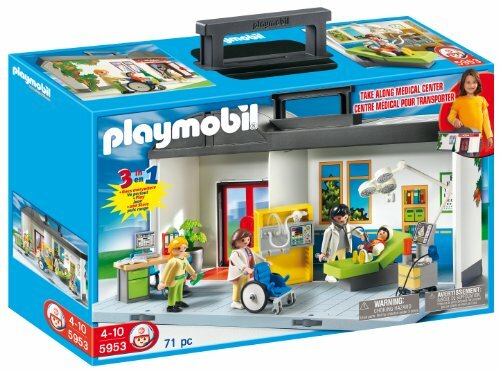 Treat the patients in your very own Playmobil Take Along Hospital. 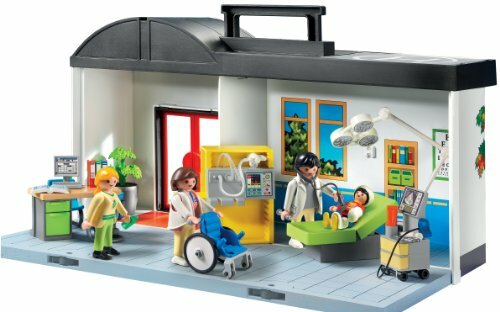 Set includes four figures, wheelchair, medical equipment, and many other accessories that can all be stored inside the Take Along Hospital. The set comes with a convenient handle so it can be transported anywhere. Playmobil, Germany’s largest toy manufacturer, is headquartered in Zirndorf, Germany and has been producing and distributing toys for more than 36 years. The miniature worlds of Playmobil encourage children to explore and learn while having fun. Children's imaginations are transported to medieval times with the Playmobil castle, to the adventurous seas with Playmobil pirates, and many other themed playworlds. The figures can bend, sit, stand, and turn their heads to make realistic role play possible.